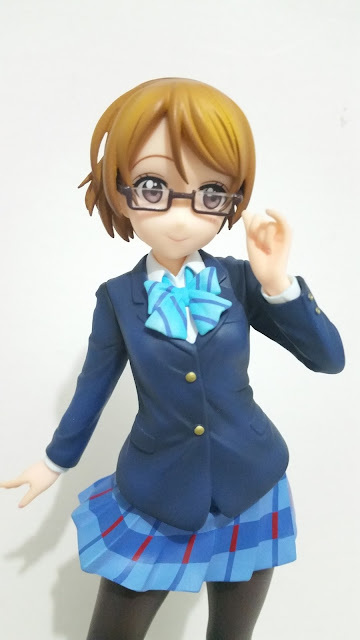 I was hesitating a lot between this version by FREEing or the upcoming Alter version but decided to get this instead since she has glasses and Pana with glasses cannot be resisted. 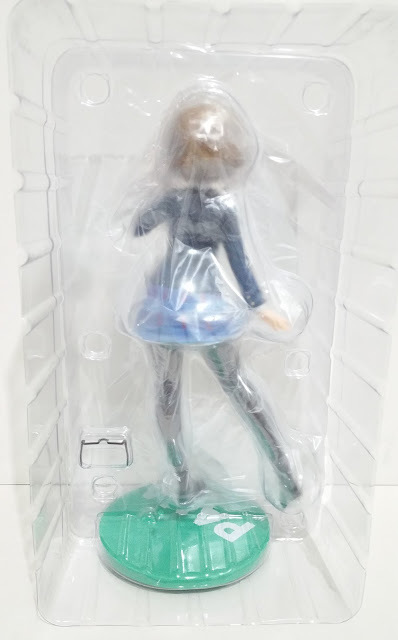 However there are several points about this figure and the packaging which disappointed me and I hope that any FREEing fans out there who read this will still continue to support FREEing for the rest of their amazing lines. My mistake with this loot was with opening Hanayo after Mikazuki. 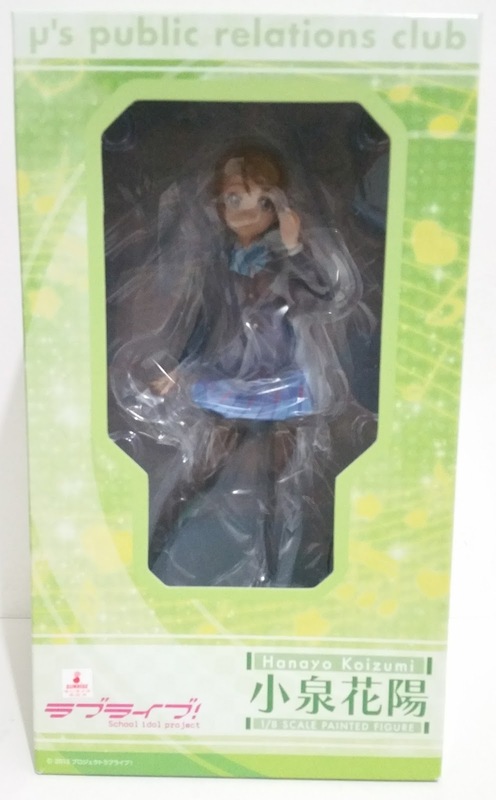 This took away a lot of excitement and joy from seeing Hanayo because all I could see initially were the bad points. 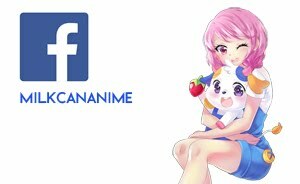 I took several days between unboxing and posting this to reduce the amount of bias in this post. 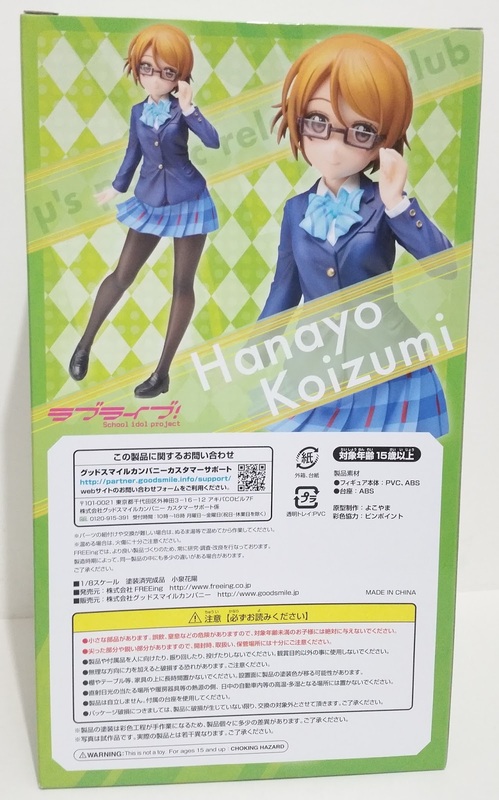 Hanayo comes with a green box which matches her image color. I love how the sides of her box shows her front view on one and her back view on the other. There are also windows, which allow you to see the figure through the box so better decisions can be made about purchasing her. Unfortunately, the shapes for the window cut-outs are very strange and I don't know why they would choose such cut-outs. 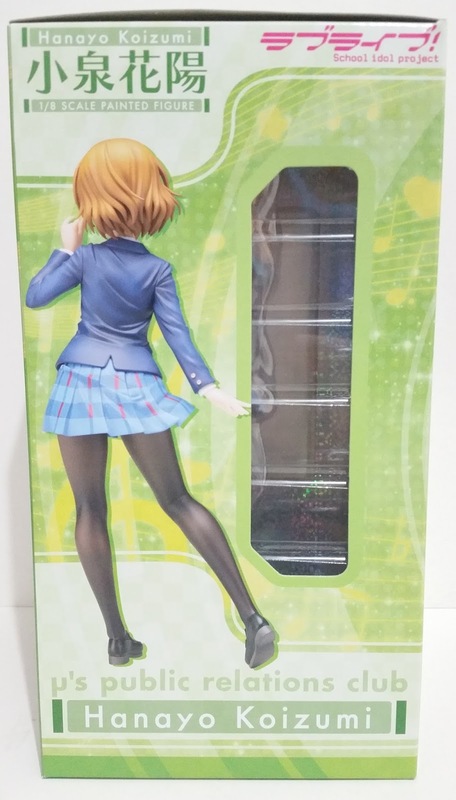 Two other bad points about this figure includes the thinness of the cardboard making up this box, which is of similar thickness to an ichiban kuji chibi-kyun box. 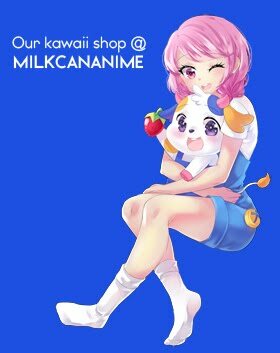 I expected better of a renowned figure company, and for a figure so much larger than a chibi-kyun. Honestly, even prize figures can do better than this. The second point is minor, but how it comes with a single tape to secure the box. All the scales I have gotten, be it from Good Smile Company or from Griffon Enterprises, have all came with three pieces of tape to hold down the flap of the box to prevent spillage of parts even if the blister opens. 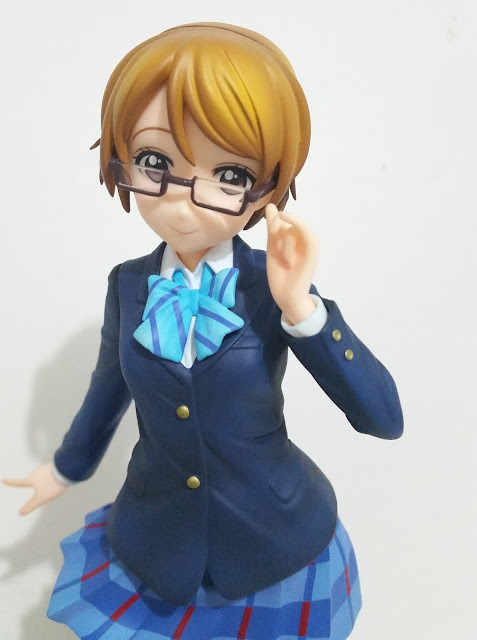 I expected better from FREEing, especially since Hanayo's glasses are small and detachable. Here is the blister front and back. 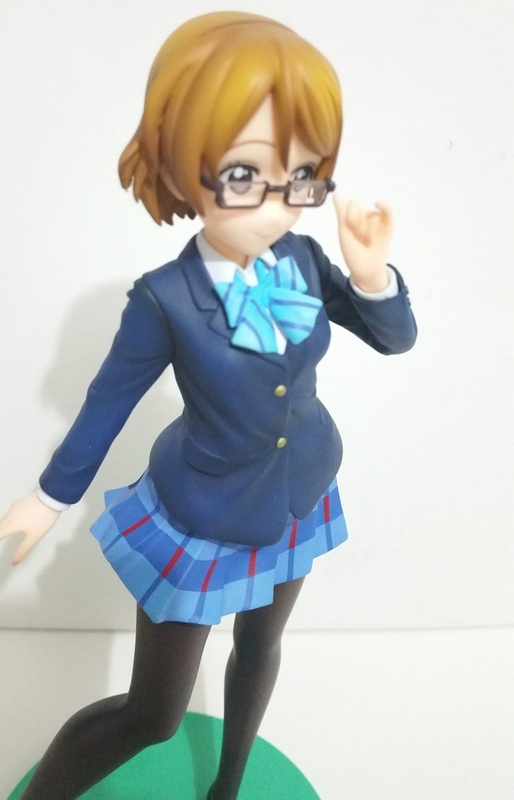 You can easily see that she comes with a base and a pair of detachable glasses and the main figure. 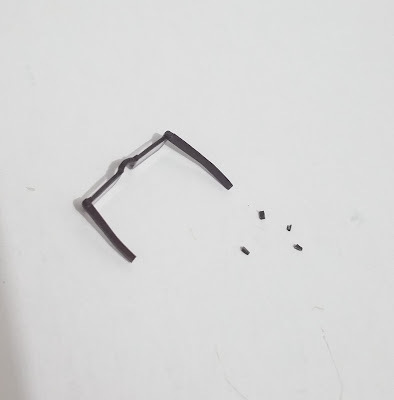 The blister is held together fairly securely, however there was no tape to secure the two pieces together. Not expecting that, I opened the blister as usual, which was tight and hence popped when it opened, sending the glasses flying out of the blister. 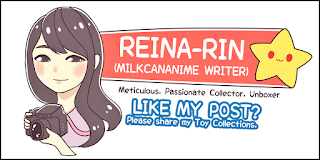 Be careful if you are unboxing her, especially if you have a lot of things lying around and the glasses might potentially go missing among them. 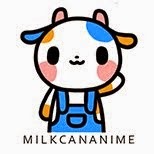 Fate has it that I will get both Mikazuki and Hanayo on the same day and they both have simple bases. 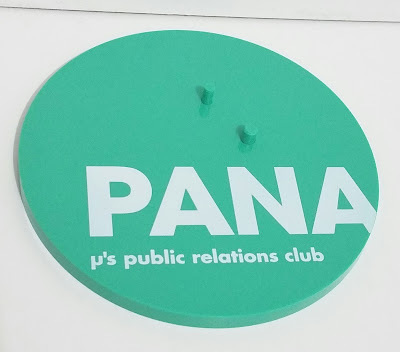 Hanayo's come in a flat green and has printed words on it, which includes the theme of being a public relations club and her nickname "Pana". While it is endearing, it is also saddening that they didn't include her name "Koizumi Hanayo" in small print somewhere on the base. The green also does not tie in well with the color palette of the figure, and it is actually quite glaring and makes her very difficult to color coordinate into a group of other figures due to the vast difference in color choice for the main figure (relatively dark colors) and the base (as a result, quite eye-catching green). 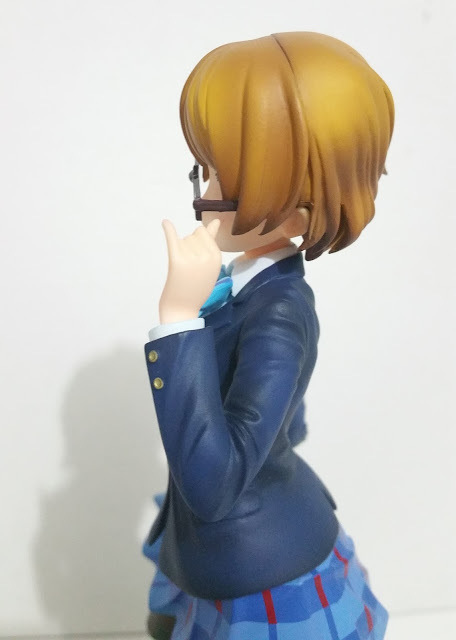 The pose (and glasses) is the reason why I chose this figure of Hanayo over the Alter one, as the position of her head in the Alter one was slightly off. 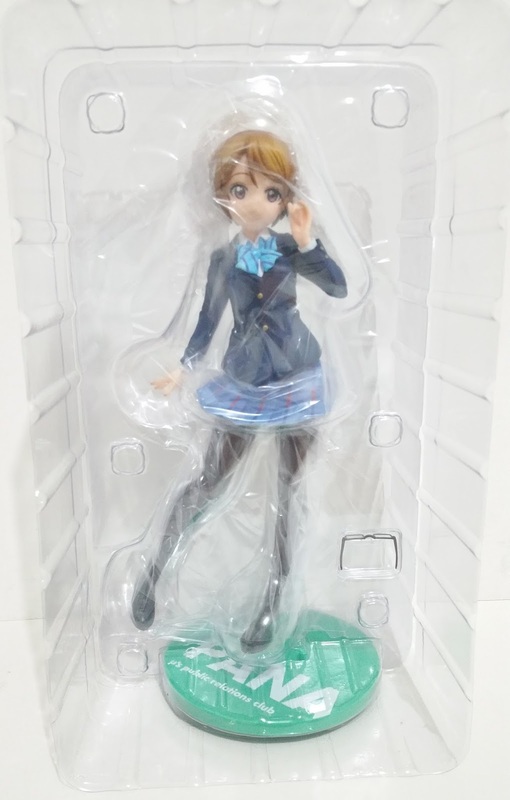 So for posing-wise, I prefer this Hanayo too and this actually pulls off the shy but energetic (about idols) feel for Hanayo which was how she was in Episode 1 of Season 1 in the anime, which is coincidentally also my favorite side of her. Assembly is simple with regards of putting her onto her base. Only her left foot has pegs, which makes me wonder about the stability but at least her pose isn't that dynamic. 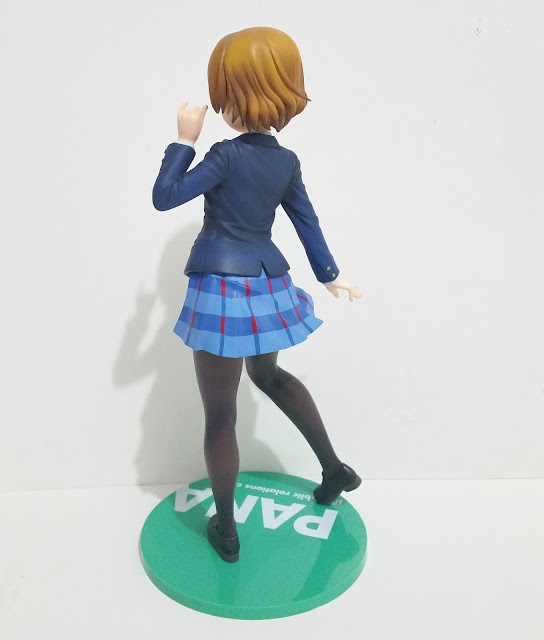 In comparison to this, the Alter's line always has the figures shaking a lot which definitely makes more of a point about stability than this more-stable-looking Hanayo figure I have here. 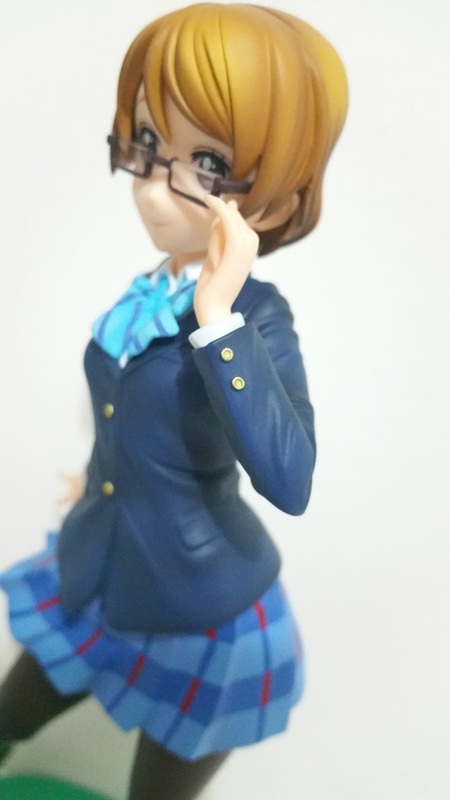 Putting her glasses on is more of a pain though, which brings me to the next point on my disappointment with FREEing. She doesn't come with any instruction sheet! I'm wondering if they forgot to add it into my copy... In any case, do check with the illustrations on the box to get the glasses into the right holes between her hair parts. Mine didn't come out looking great so I made minor modifications to my copy, which I would cover as part of the next section. Does Hanayo look a little derpy? If you think so, we share the same sentiments! 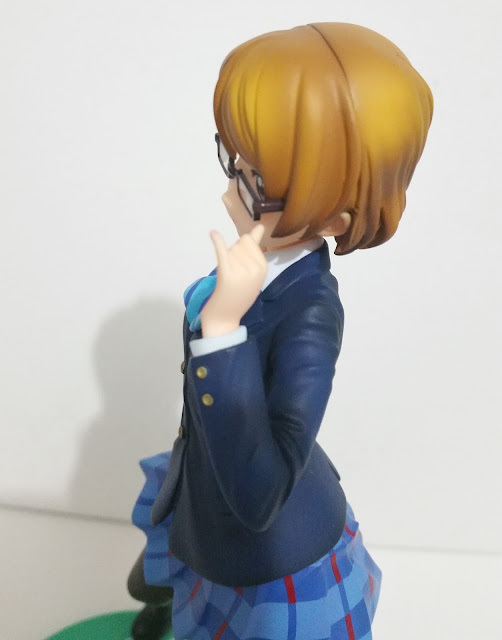 This is the problem with the glasses on my copy of Hanayo. As you can see, her face is slightly angled, thus her glasses should not be of the same length on either side, which mine was. Of course, it could also be a problem with her hair sculpt, leading to it interfering with me pushing the ends of the frames in. Either case it was, the result was that the glasses cannot sit close enough to her face and end up jutting out weirdly for the left half. The right half, however, fits perfectly. After about 10 minutes of struggle with this and not finding any peg or hole in her hair (or any other means) to push the glasses into, I decided to make a move I would have never thought of before, and probably wouldn't if FREEing hadn't pissed me off so badly on that one day I unboxed her. 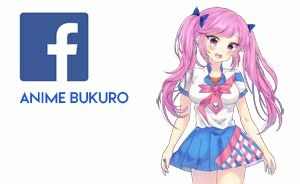 I decided to clip off a portion of the frames on her left side to make it shorter than the right so it would fit. This took me about 7 more minutes as I kept taking off bit by bit and struggle to put it back on her to see if I had to clip off more. No regrets though, because in these cases, less is always more. 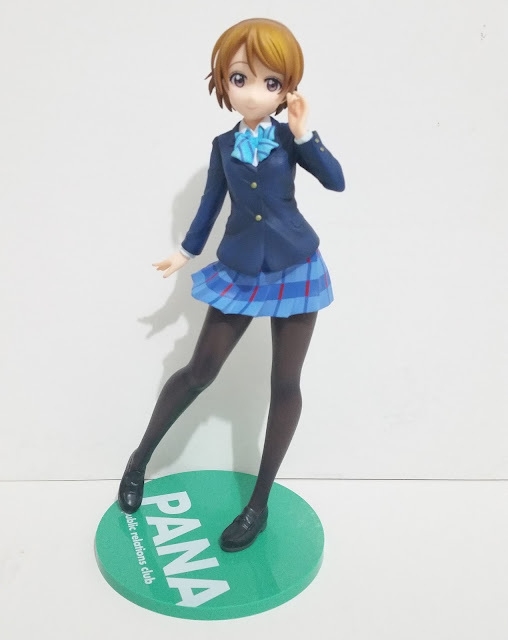 A less derpy Hanayo is born! You can certainly see that the glasses are a good fit for her now, no longer with that awkward jutting out on the left half. For the record, this was how much I took off. It certainly looks like it is a lot, and yet it was a lot and till now I still wonder how I found the courage to do that when the most I ever did was filing Nendo base stands so they fit into the holes on the Nendo's back. You can also see the pieces I took off getting bigger with every try -- the tell-tale signs of impatience, annoyance and of course, confidence. 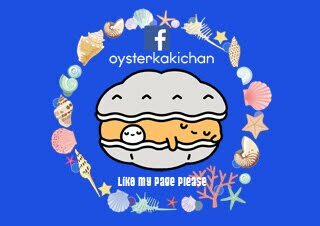 So glad I didn't screw this up. It seems like fellow collectors on myfigurecollection might not have the same problem, so it might just be my one copy that has it, so rest assured, you might not need to do this extreme method unless you have extremely bad RNG like myself. One thing that caught my attention in this figure is its simplicity. 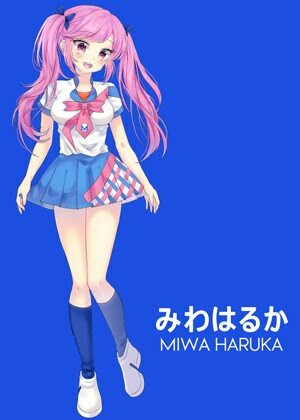 Otonokizaka High School school uniform is definitely not the best and neither is it elaborate. However in this figure, it looks beautiful and I have the sculpt to thank for that. 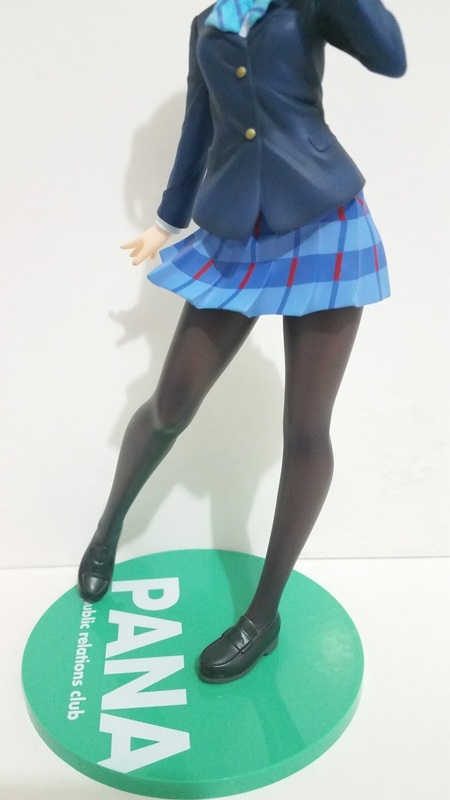 She has a simple outfit and pose, yet it feels dynamic due to the sculpt of the skirt. From this image, I would like to point out the sculpt of the blazer, pockets and all. You can clearly see it is of a thicker material compared to the thinner shirt underneath. It's amazing how the sculpt can easily display such elements. The patterns on the skirt are crisp and the red isn't too jarring. 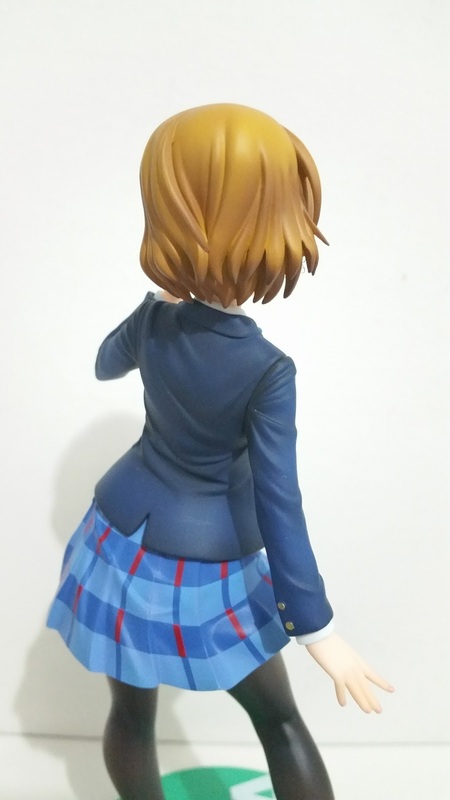 It actually helps to highlight the skirt to draw attention to one of the best parts of this figure -- the flow of the material. Looking further down, we see her stockings which are brilliantly painted to look like they are stretched with the slight hint of beige. Being the only stockings girl in the nine, this exerts her charm points perfectly. And nothing less than that for FREEing, with has a line of stockings and bunny girls, they have certainly mastered the art of making perfect stockings, no matter what kind and form they take on! 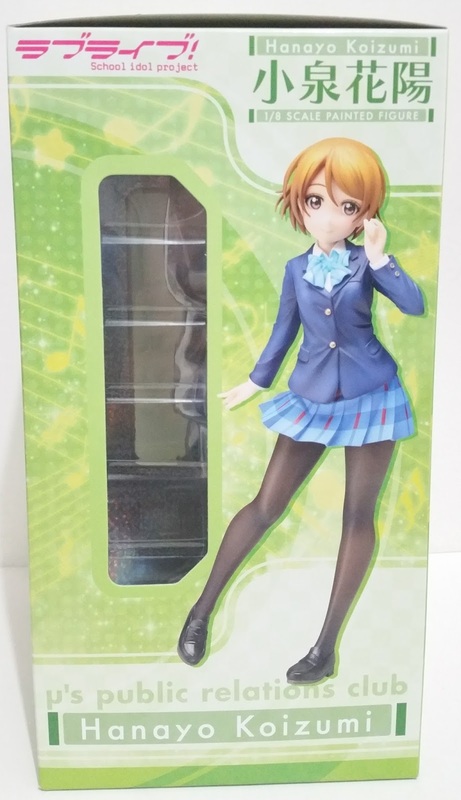 Hanayo's shoes are simple yet detailed too. 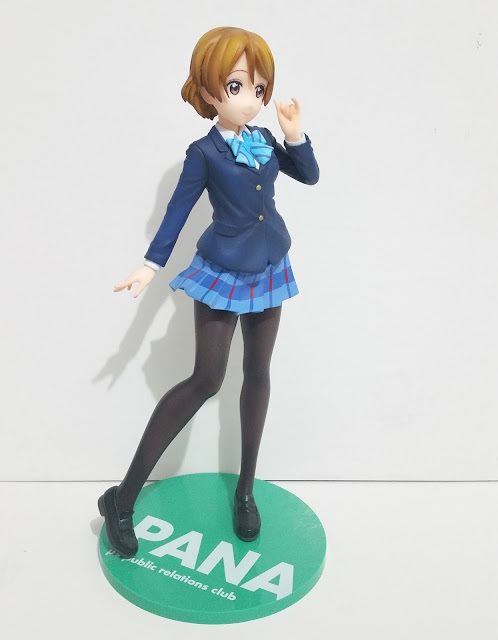 While they don't draw attention, if you look at her loafers on their own, you will see that some thought has been put into them and they are sculpted after those in the anime and the respective design is shown, with the sculpt clean and crisp. It also uses a slight glossy paint to pull off the polished effect. The ribbon that differs by year is cleanly sculpted and painted as well. There is minimal movement in the piece but due to the sculpt, it looks lightweight and realistic. Likewise, due to the sculpt and the light blue paint, the ribbon pops and adds on to the figure by adding a separate dimension of color. Not only patterns, but the buttons in this figure are also well-defined. There is an indent for those on her wrist and I checked against the other arm, which shows the same indentations for the buttons there too. Such indentations are not present for the ones on her front though. Those buttons are completely entire. Last but not the least, we will look at her hair sculpt. I love how they did the back of her hair for her. None of the strands are out of place but look very realistic and well-defined. I also like how some strands reach up to almost the crown of her head instead of giving that smooth hair for the entire back of her head, then suddenly flare out at the bottom to give individual strands. 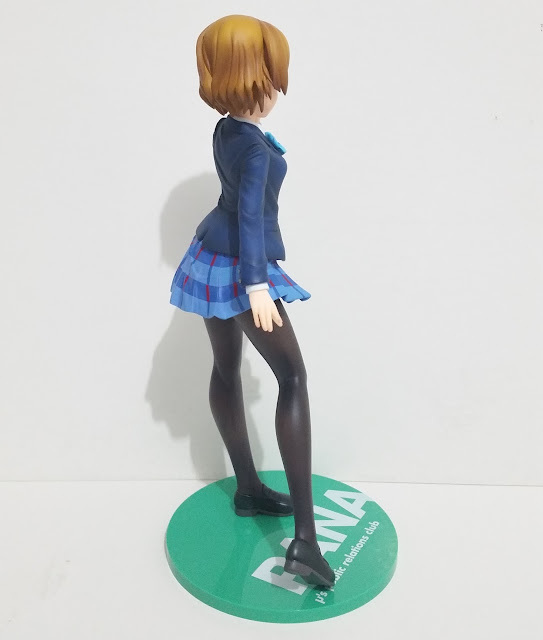 That (the latter) is not realistic and looks horrible for the figure when viewed from the back, and is associate with poor quality as most prize figures which are like that. 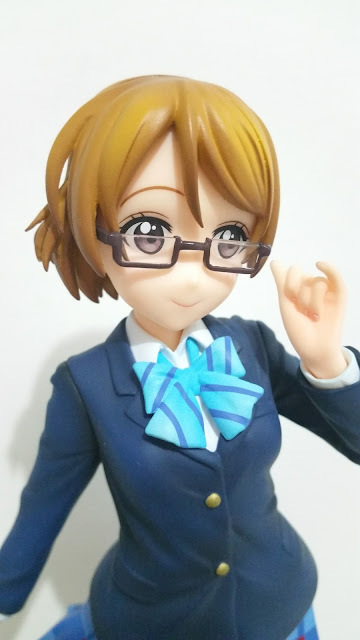 Hanayo also has virtually no hairline as it is easily masked with her hairstyle. As much as this is easy to accomplish for long-haired figures, it is less simple to do for short hair characters so kudos to FREEing for managing to pull that off. While this is a fun figure that represents Hanayo a lot, the defects on my copy really puts me off a lot. However if given the choice to purchase her again or not, I would still choose her over the Alter's design because I really do prefer this design. There were no major issues except the glasses, which can be easily overlooked by keeping it stored away in the box. 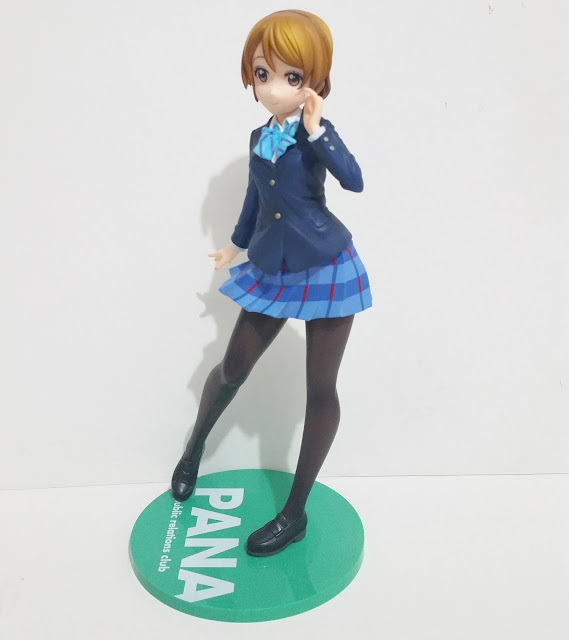 If you too are a fan of this design, do get her as she's literally quite cheap (price is dropping on Amiami even) as compared to most other figures at this quality, and definitely cheap for one who comes with two display options, in this case, with and without glasses. No Comment to " Figure Unboxing and Review: Koizumi Hanayo (Love Live!) 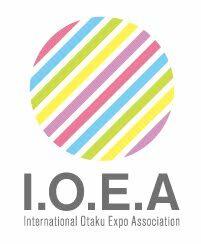 1/8 Scale (FREEing) "